← Key Lime Bars … Best Dessert EVER! A recent request got me to looking through my collection for a simple, tasty approach to eggplant in the summer. I like this one, served with thick slices of Jersey tomatoes that have been drizzled with good olive oil and fresh-chopped oregano. 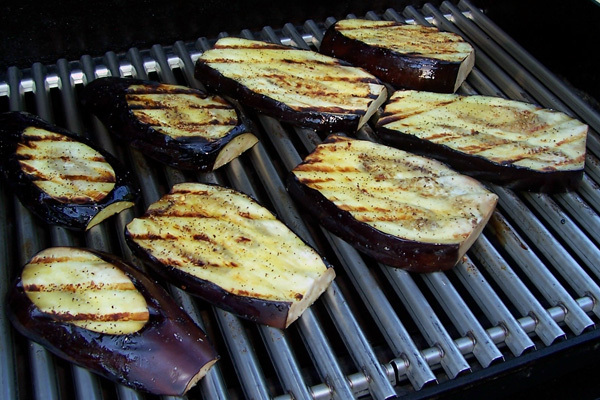 3/4 c. olive oil Combine all ingredients for the basting sauce and let stand for one hour.While the oil is standing, slice the eggplant crosswise into 1/2 inch slices. Arrange the slices in one layer on a large rack set over a tray and sprinkle them with half the salt. Turn the slices, sprinkle with remaining salt and let drain, turning them once for one hour. Pat the slices thoroughly dry with paper towels. Brush one side of each slice with the basting sauce and grill the slices, oiled side down on an oiled rack set 3 to 4 inches above glowing coals. Grill for about 3 minutes per side. Brush with more oil and turn them. Grill for about 3 to 4 minutes more or until they are browned and tender. Transfer grilled slices to a platter. Drizzle with a small amount of any remaining oil. Sprinkle with ground pepper to taste. Chill the eggplant, covered, for at least 4 hours or overnight. Serve them cold or at room temperature as a salad or appetizer with sliced French bread.